Tenants in New York City's poorest neighborhoods are under attack. Despite the existence of laws such as rent stabilization to protect tenants from high rents, landlords are creating new ways to push rent stabilized tenants out of their homes. One such tactic is the use of non-rent fees, a confusing and often times unwarranted set of charges that are added to a monthly rent statement (see Figure 1). These include fees on appliances (air conditioner, washing machine, dryer, and dishwasher), legal fees, damage fees, Major Capital Improvement (MCI) rent increases and other miscellaneous fees. Often these fees appear on a tenant's rent bill without any explanation. If a tenant fails to pay, even if they are unaware of why the fee was imposed, they are sent letters that make them feel that they are being harassed and are threatened with eviction by the landlord. Most tenants have a right to object to many of these fees, and landlords are legally prohibited from taking tenants to Housing Court solely for non-payment of additional fees. But many tenants don't know their rights about the fees and often pay them when they shouldn't. For low-income and working class tenants who struggle each month to pay rent, these fees add up and make their housing costs unaffordable. While some of the fees are legal, many of them are not, and the consistency and pattern of the way the fees are being charged and collected suggests that some landlords are intentionally increasing tenants' rent burdens to push out long-term, rent stabilized tenants. This problem is proliferating in the Bronx, where New Settlement's Community Action for Safe Apartments (CASA) works to improve living conditions and maintain affordable housing. This is particularly apparent in buildings owned by Chestnut Holdings, a company that is fast becoming one of the biggest landlords of rent stabilized buildings in the Bronx. In order to learn more about how these fees are impacting rent stabilized tenants in the Bronx and develop recommendations to reform the fee collection system, members of CASA partnered with the Community Development Project at the Urban Justice Center, New York Communities for Change (NYCC) and Northwest Bronx Community and Clergy Coalition (NWBCCC) to conduct research about these fees. Staff and members from the above organizations collected surveys at legal clinics, tenant association meetings and organizational events. All survey respondents live in rent stabilized buildings owned by Chestnut Holdings. In total, the coalition collected 172 surveys from 23 buildings, representing 13% of the number of apartments in those buildings. The research sample accounts for 4% of all the apartments that Chestnut Holdings owns, and 28% of the buildings. Researchers also collected rent bills and other supplemental materials (including letters to and from landlords, housing court decisions, and more) from 196 Chestnut Holdings tenants. Coalition members chose to focus on these buildings because they are rent stabilized and located in the neighborhoods where each organization is actively working. Data in this report comes from surveys, recent rent bills collected from Chestnut Holdings' tenants and interviews with tenants. 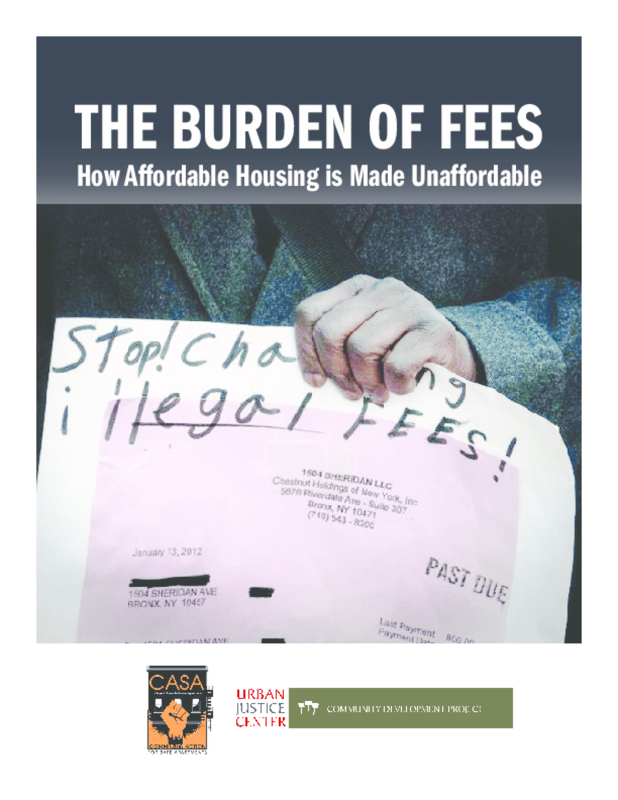 Overall, we found that the problem of non-rent fees is serious and widespread in the Bronx. 81% of the tenants we surveyed had been charged some sort of fee. From the rent bills we reviewed for this report, the average tenant had $671.13 in non-rent fees on their most recent rent bill. Copyright 2013 Community Action for Safe Apartments, Community Development Project at the Urban Justice Center.